You have to do better than a “copy-and-paste” of an old job description to write a job description that stands out and engages the best talent. Many of you still use job descriptions written by someone with little to no marketing skills. Or perhaps copy-and-paste the JD from an unknown source. Let me give you a different approach. When writing any ad, the goal of the headline is to get the reader to read the first sentence of the rest of your ad. With job ads, it’s no different. Your job title (along with your company name and location) IS your headline. Don’t try to be cute or clever — Avoid using silly words like Wizard, Guru, Genius, Ninja, etc. — they almost never add value. People have measured this. Don’t use inside lingo — Don’t use a title with a tier like Legal Secretary 2 (I saw Geico use this the other day) unless you want the candidate to feel like a cog in the machine. Note: — Don’t put the name of the location in the title unless there is absolutely nowhere else for you to put it (your own career site and job boards should have a separate field for location — just use that). The goal of the first sentence of a job description is to get the candidate to read the second sentence. And all candidates (customers) tune in to the same station: “WIIFM” (What’s In It For Me). The best way to start off a job description is with a top benefit or two that the candidate will receive. And I’m not talking about the classic HR benefits like 401K and gym membership. I’m talking about the more holistic benefits that serve your candidate’s self-interest. For example, let’s say you’re writing a JD for a software developer. Well, most developers care about writing software used by many people. So, if it is truthful that this developer will write code that will get in the hands of many people, then say it! How would you like to create an app that could be used millions of people around the world? — and if the software is used by less than millions of people, then put in whatever number is possible (even “thousands of people” is going to turn on most developers. Note: A fear that many software developers/engineers have is that their software gets used by no one. How would you like to learn how to sell better AND get paid for it!? Do you see the power of that opening line!? When I was first learning how to write a job description, I asked the best player on my team what I was leaving out of the job ad I was writing. She said: “Team”. Duh. Candidates are humans and they want to know what team they’ll be on. If the developer is going to work on a “Cloud” team, mention it. If the analytics team is working on your Corporate team, mention it. If the sales person is part of a team selling a new product called XYZ Services, mention it. Do you know who the position will report to? Then mention that manager’s title! And try to include the goal of the team and any unique characteristic about the team too. Candidates also want help envisioning what their new day in the life will be…so tell them. Note: You can show a day in the life through video (a specialty of the Ongig recruiting platform) but in this article I’m focusing on writing ad copy/text. I recommend you minimize boring bullets on their responsibilities. Instead, try using bullets on things they might do on any given day. And try to include a fun bullet in there (e.g. “End the day with a fun happy hour with your team!”). Afterall, not all work is work…some truly is fun! This way, the candidate will start to envision working with you…and psychologically that has been proven to lead to them taking action (applying!). Mastering how to write a job description is not easy…and it’s often counter-intuitive. When copywriters write a good ad, they are 100% ok with turning off certain people. A couple of us call this marketing concept “alienating the non-prospect”. 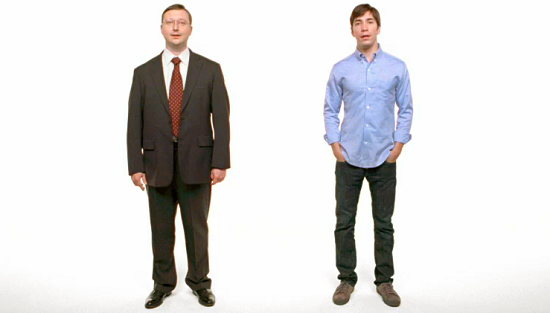 A famous example is the Apple ads where they had the Mac Guy versus the PC Guy. Apple knows the ad pokes fun at the conservative PC Guys…but Apple doesn’t care. If they attract just the people who want to be Mac Guy, then they’ve attracted many millions of people! The sames holds true for writing job ads. The last thing you want with your JD is to have everyone and their mother apply, right? You’d be too busy screening them to find the best candidate. Mention travel — If the job requires a certain amount of travel, mention it. You’re going to lose some people who don’t like to travel but, hey, they are not a good fit anyway. Be specific about requirements — If you need the candidate to have X years of experience or knowledge of a certain cutting-edge tool or to “drive new business”, then say so. Afterall, which would you rather have: 25 applicants with 2 fantastic candidates? Or, 200 mediocre applicants? The reason I wrote this article is that I believe you will boost your quality and diverse applicants by writing job descriptions more like an ad copywriter. I hope you found this article helpful for writing your own job descriptions.